Just in case you’re planning on grabbing a Ginger Rogers cocktail or raw oysters or their soft garlic pretzels with Vermont cheddar Mornay sauce (the best!) 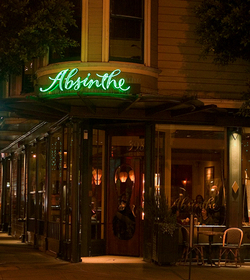 at ~ABSINTHE BRASSERIE &AMP; BAR~, the restaurant is currently closed for a refresh until Thursday September 7th. I’ll remind you when the renovations are complete. And don’t worry, you can still book a table for opera season!